If weather is not permitting in your area, please notify us to hold your order. Consider using Heat Packs in winter time. Planting instructions, seed germination instructions, and any other special instructions will be included with every delivery according to the nature of the order. What to expect in a box? We guarantee our plants to be healthy at the time of shipment and true toscientific name to the best of our knowledge. We do not hold orders more than 2 weeks. Orders delayed by request are subject of availability at time of shipping. Out of stock items will be refunded. Orders are shipped from Monday to Thursday on first come, first basis, within 3-7 days, using FedEx or Priority mail. Contuct us to expedite your order. All claims must be submitted in writing only, and only within 3 days after delivery. Please include picture of item if it is damaged. We can not be responsible for any damage occurred during transportation. Damaged or lost packages must be claimed with the carrier. We can't guarantee the plants to be alive if they a shipped without temperature control (heat pack) in winter or if they are overheated in summer. Monitor weather in your area. If it's too hot or too cold, notify us, we can hold your order for a few days. Consider using Heat Packs in winter time. You will receive shipping confirmation email with tracking. Make sure delivered package is not sitting on your porch all day. If weather is not permitting, plants could be shipped at your own risk only. We will not assume responsibility for plants which have died as a result of improper planting or care. No guarantee, expressed or implied, is made for the successful growth after planting. If you don't know how to grow a certain plant, please contact us with any questions in advance. We try to offer the best advice we can about hardiness and growing conditions. This is a service and not a guarantee. Shipping stress. All plants after being in transit for a few days without light and water, exposed to temperature extremes and handling, will experience stress. We guarantee the plant is healthy when it leaves our nursery, and shipped in proper packaging to keep stress on the plant to a minimum. We are not responsible for the plant after it leaves our direct care. No other guarantee or warranty applies to these plants. By ordering a live plant mail-order you take a risk of receiving a wilted plant, which in most cases, under proper care, will recover soon and bring you a joy of accomplishment. We reserve the right to refuse making a sale to anyone. Sometimes, we may suggest a certain customer to buy plants someplace else. We reserve the right to limit quantities purchased if stock is low. Shipping cost generated automatically and depends on particular plant (size, weight) and destination. To see shipping cost, add items to shopping cart, chose destination state, and click "Add shipping". Items with free shipping will show 0 shipping cost; flat fee is based on min order and destination state (see details). Shipping cost is automatically calculated for the US only. For shipping outside of the USA, see International Shipping and contact us for a quote. Many of our plants are very large size and heavy weight! - packaging / boxing and packing supplies. We also provide the utmost care in choosing high quality packing supplies to ensure your plants have a safe journey. We often lose on shipping costs! 1) Min order to CA - $100 before S&H. 2) Certain CA counties (Orange, Alameda and others) will require a $50 phyto certificate that will be added to your S&H cost after your approval. Otherwise, the order may be cancelled. 3) Certain plants that are NOT certified for shipping to CA are marked so in the price-list. Certification is done once a year (in September) and we can not add other species to that list until next year. Some species (like palm trees, peaches, persimmons, apples etc) are in CA no-ship (prohibited) list and can not be shipped to CA addresses. 4) Flowers and fruit will be cut off plants traveling to CA addresses due to CA state agricultural import requirements. This means, your gardenias and jasmines will have no flowers on them, and mangoes have no frut when arrive, even if the plant is advertised as in bloom/fruit. Sorry, their rules, not ours! We can't ship live plants to military APO addresses. Mainly because we don't know where it is located, and locations outside of the USA require compliance with live plant export-import regulations, which is complicated procedure. Also, we don't know how long it will take to deliver the plant and if the package will be opened, so we can't guarantee anything. Orders with live plants to APO addresses will be canceled unless you specify more information. We ship outside of the USA. Please see more information: International shipping. Shipping Days. Packages are shipped out Monday through Thursday to avoid over-weekend delays. - USPS Priority Mail (HI, PR, VI) Expedited Shipping. Occasionally, orders will need to be shipped via expedited service depending on plant sensitivity or customer request. Please notify us of any rush prior to shipment. Valid email address is important! On the day of shipping, you will receive an automatic email with your tracking information. If your order is shipped via USPS, the email will contain a delivery confirmation only, and not tracking information; it will simply confirm that the package was physically delivered to the Post Office and accepted by USPS for shipping. Please make sure that your delivered package will not be sitting on your porch all day. We can't guarantee the survival of your plants without proper temperature control. Time in transit is generally between 2-4 business days. We do our best to ship your orders as soon as possible, sometimes withing a day or two on first come first serve basis, and usually within a week of placing the order. You may notify us of any rush so we can expedite processing of your order! If you were notified that your order was shipped, but have not received the package within 4 days, please check with the carrier, as delivery may have been attempted in your absence. You may check your order status online at any time. Per PayPal requirements, all orders over $200 (paid using PayPal) must be shipped with a signature confirmation required. Which means, if nobody is available to sign for the delivery, the carrier will not leave your box at your door, and you will need to pick it up at the Carrier's office. We advise that you prearrange instructions with your local carrier to hold the package at the office to avoid plants spending excess time within the delivery truck. This rule is applicable only to orders that are paid through PayPal. If you pay with a credit card using our server, then your order will be shipped without signature confirmation, unless specifically requested. We always try to send you the best, mature, largest size plants availble! Some of our plants are much bigger than those that you might get from other mail-order companies! To save you money on shipping, we work to minimize both package weight and dimensions. (See Our Products page, and Size of Plants for more information). To shed unnecessary weight, we remove plants from pots, toss off excess soil, and maintain moisture with a food-grade plastic film wrapped firmly around the root ball. We do not bare-root plants for domestic shipping! To save on dimensions, it is sometimes necessary to trim branches, but only when without consequence to the plants health. We strive to safely package every plant to the fullest extent possible. Read more about plants shipping and possible problems. Notify us to hold your order if it's over 90F in your area - otherwise plants may get cooked in a package. Once your plant has arrived, it should be unpacked and potted immediately. You should let the plant adjust after shipping stress for a minimum of 24 hours (and up to several days). Place your plant(s) in a warm location with bright shade (no direct sunlight), in a small pot with well-draining moist (not soggy) soil. See more instructions. Upon arrival, keep the packing list with your discount voucher to save on your next purchase. To receive our New Arrivals updates and more dicount coupons, you may subscribe to our Newsletter. Our company ships rooted, well-established plants of mostly rare and hard-to-find species. We provide you with the biggest and healthiest specimens that are currently available in stock (see more info about plant size). Most of them are flowering size, or fruiting size - this means, they will fruit and flower soon under proper care. We grow our plants in natural outdoor conditions, under Florida sun and rain, fertilize them to maintain and promote healthy growth and well-developed roots, but it is not our goal to keep them flowering at all times. We are not a florist shop that offers shaped arrangement in fancy wrapping with bows and ribbons. We ship strong and healthy plant material, specimen plants for the purpose of longevity and allowing you the personal opportunity to experience the joy of planting, and growing... long lasting future of gardening fun! If the plant is intended as a gift, please consider if the recipient will be willing (and capable) of providing all the above. If you are inexperienced in establishing mail order plants, feel free to contact us for cultivation advice before ordering. !!! By ordering from us you enter into legal contract where you have your resposibilities as well as we do. We value our customers, and please respect our hard work and service. E-mail only, within 3 days period. All claims must be submitted in writing only, and only within 3 days after delivery. Please email us if you have any problems; if you call us regarding any claims, you will be asked to email us anyway. make sure delivered package is not sitting on your porch all day. We can't guarantee the plants to be alive if they a shipped without temperature control (heat pack) in winter or if they are overheated in summer. We do our best to notify you about shipping/arrival day beforehand. monitor weather in your area. If it's too hot or too cold, notify us, we can hold your order. Consider using Heat Packs in winter time. Shipping cost is not refundable. We can ship replacement with your next order. Contact ASAP. If you received a plant that got weak or broken - EMAIL us immediately, it may be saved, and we can help you! Pot size - important! DO NOT plant in a pot larger than the root ball! Only after establishing, when the plant starts a new growth, you may move it in a bigger size pot. Proper care. If you recieved a healthy plant, but it dieв because of improper care, it can't be replaced. Keep arrived plant in warm (not hot) conditions, in a pot in shade until it gets adjusted and recovered from stress. Don't plant out of package into a full sun! Correct mailing address. We're not responsible for errors in mailing address or delivery instructions. We use computerized system to print labels and ship to exactly the address you provided at the time of your order. Please double check the address in email confirmatrion. We don't accept any claims result from such errors. PO Box addresses are not acceptable for some shipping methods. We may contact you for physical street address or if your address is marked as "non-deliverable" in the postal database. Shipping confirmation. You should receive shipping confirmation email with tracking number for FedEx or USPS (Postal Service). This email is important! If you don't receive package within few days, then check the shipper website (link is provided in confirmation email). Do not let package sitting at the carrier's office if you did not notice tiny pink slip in a stack of mail. Make sure to provide valid email address and if you did not receive order and shipping confirmation - contact us ASAP. Special delivery instructions. We try to accomodate them and print on the shipping label. Simple instructions like "leave at door" are acceptable, but complicated like "leave behind 3rd tall palm to the left of the 2nd garage door" are not. Most likely carriers will not follow such instructions (they won't even read it) to your satisfaction. So, we can't be responsible for it. Secure delivery. If you believe there is any risk that deliveries in your area may be misplaced or stolen, we strongly recommend shipping to your work address, or any person who can accept the package for you. You may request Signature Confirmation. This will require someone to sign for the package or to be picked up at the carrier's office. If the Delivery Confirmation records indicate that your package has been delivered, we can not accept a lost product refund claim. Lost package. If you believe your package was lost in transit, we reserve the right to initiate the inquiry to determine if the package was actually lost. We follow proper shipper procedures to determine if the package was signed by another person, stolen, or lost. If you have not received your package and the shipping company confirms lost package was not delivered, then we will re-ship the order again. We will not reship or refund orders for which the shipping company can confirm delivery at the destination. Order changes or cancellation. If you decide to change something in your order, add more items or cancel, you have to do so in writing: email or fax. We do not accept any changes over the phone. If your order has been already packed, no changes can be made. If you decide to cancel the order, cancellation/restocking fees may apply (up to 6%). Shipping stress. All plants after being in transit for a few days without light and water, exposed to temperature extremes and handling, will experience stress. Some more, others less. We guarantee the plant is healthy when it leaves our nursery, and shipped in proper packaging to keep stress on the plant to a minimum. We are not responsible for the plant after it leaves our direct care. No other guarantee or warranty applies to these plants. By ordering a live plant mail-order you take a risk of receiving a wilted plant, which in most cases, under proper care, will recover soon and bring you a joy of accomplishment. Scientific names and cultivars. We guarantee the plant is true to name to the best of our knowledge. Plant health. We're a certified nursery inspected by the US Departament of Agriculture on regular basis. We posses a number of certificates, including CA nematode certificate, Fire Ant certificate, etc. and grow all plants according to their requirements. We ship only healthy plants which are properly treated, and apparently free from deseases and pests at the time of shipment. If your local authority requires post inspections then it's your responsibility to comply with it. We can't be hold responsible for incurred extra cost and results of such inspections. Weather permitting. 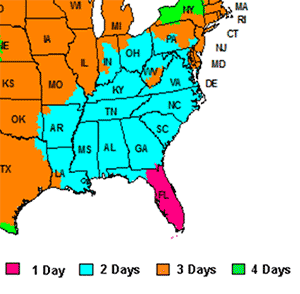 We sell tropical plants, and we suggest you to watch your weather for safe shipping. We ship year 'round, but we are unable to monitor the weather at every location, that's why we advice you to let us know if you're expecting a snow storm, extremely high temperatures, etc. - so we hold on shipping your order. If weather is not permitting, plants could be shipped at your own risk only. Once you received a plant - this plant becomes yours. No guarantee, expressed or implied, is made for the successful growth after planting. We will not assume responsibility for plants which have died as a result of improper planting or care. If you don't know how to grow a certain plant, please contact us with any questions in advance. We try to offer the best advice we can about hardiness and growing conditions. This is a service and not a guarantee. Planting instructions. Please remember that plants are living things and require your immediate attention upon their arrival. Please read our planting instructions. If you receive a plant which has been damaged in shipment be sure to notify us as soon as possible. Poisonous plants. Some plants or their parts might be poisonous or cause undesirable reactions or conditions when consumed internally (or inhaled). These plants are marked as poisonous or irritating in our Catalog with the appropriate pictogram. Under no circumstance such plants should be used for human or animal consumption. We do not sell plants known to us as causing severe reactions, however some people may individually experience certain conditions, such as skin rush, sneezing, etc. If you are aware of such sensitivity of yours, consult your doctor prior to plant purchase. Plants marked with a pictogram of Ethnomedical use: this pictogram is for information only. a) Plants marked as Ethnomedical and/or described as medicinal, are not offered as medicine but rather as ornamentals or plant collectibles. We are not responsible for any improper use of these plants. b) These statements / products have not been evaluated by the FDA and are not intended to diagnose, treat, cure, or prevent any disease. We urge all customers to consult a physician before using any supplements, herbals or medicines advertised here or elsewhere. Some local laws prohibit growing or importing some plants - it is your responsibility to comply with the law. Liabilities. Under no circumstances we're liable for more than the invoice at the time of purchase. In no event shall Top Tropicals, its officers, employees, or other representatives be liable for special, indirect, consequential, or punitive damages related to products sold. Seed is a live product which depends on many important related grower skills such as proper planting time, seed depth, type of soil, irrigation, proper use of fertilizers, weed controls, fungicides, insecticides, disease free soil, and reasonable weather conditions during the growing period. Germination is affected by such factors as temperature, moisture content, light intensity and contamination of planting media. These factors are totally out of our control and are your responsibility and risk. Consequentally, we cannot guarantee seed to perform properly regardless of conditions or your methods or mistakes. Refuse of sale. We reserve the right to refuse making a sale to anyone. Sometimes, we may ask a certain customer to buy plants someplace else. We reserve the right to limit quantities purchased if stock is low.